Comiso’s new study presents some striking trends. When compared to longer- term, ground-based surface temperature data, the rate of warming in the Arctic from 1981 to 2001 is eight times larger than the rate of Arctic warming over the last 100 years. There have also been some remarkable seasonal changes. Arctic spring, summer, and autumn have each warmed, lengthening the seasons when sea ice melts by 10 to 17 days per decade. Temperatures increased on average by almost one and a quarter (1.22) degrees Celsius (C) per decade over sea ice in the Arctic summer. Conversely, Arctic winters cooled from the 1980s to the 1990s. 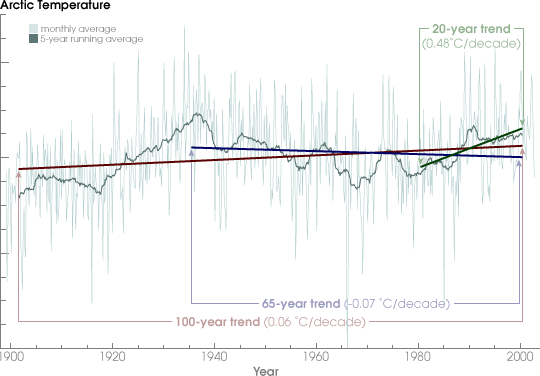 The study finds that winters were almost 1 (0.89) degree C cooler per decade. Did you notice the left side of the chart? See that little peak? It is actually higher than the current temperature. That is the elephant on the chart that NASA is silent about. Oh, then there is the rate or warming: Notice the left side line is steeper than the one on the right? It was warmer in the 1930s than now AND it warmed faster! 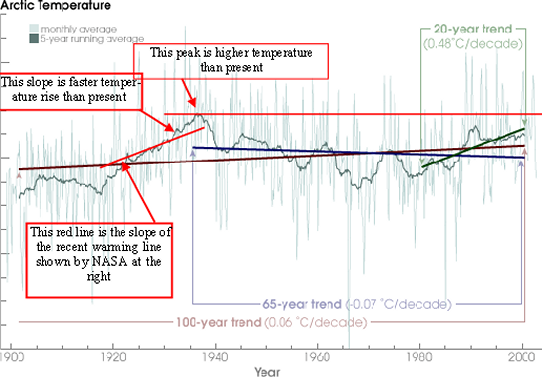 AND that is how NASA lies about climate, while showing accurate data – just ignore the elephant in the room! Other than their obvious stupidity about snow, they are lying about the record high temperatures, which have been declining for 80 years.